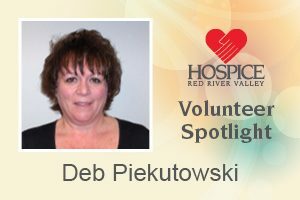 I picked Hospice of the Red River Valley to volunteer for because they give so much, and I wanted to help with that. There are many, but one of my favorites was with a women I did a couple of haircuts for. I found out she was fluent in Swedish. I had papers from my great-grandparents that were in Swedish, from when they came to America. She took the time to translate them for me. I never got to thank her, but her son found them and mailed them to me. Positive attitude and socializing. I love meeting new people!